IMAGE: “Coronado Feeders, Dalhart, Texas” (2013), Mishka Henner (archival pigment print, 102x122cm). 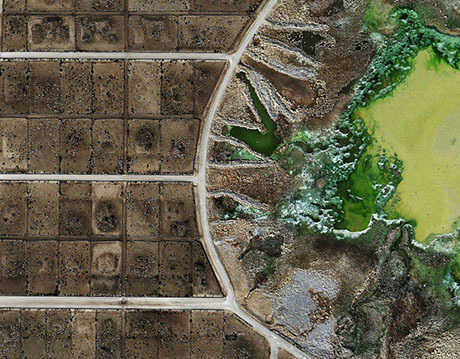 British photographer Mishka Henner’s most recent work shows the astonishing and terrible beauty of two of Texas’s most valuable landscapes — its feedlots and its oilfields — from above. 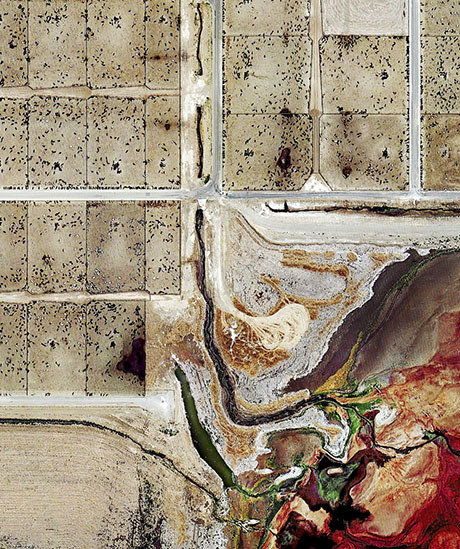 IMAGE: “Coronado Feeders, Dalhart, Texas” (2013), Mishka Henner (detail). Even more astonishingly, the aerial imagery from which these works were composed is entirely shot by machine. Henner compiled hundreds of publicly available satellite photographs of his chosen sites, knitting them seamlessly together to create ultra-high definition images that, according to those lucky enough to have seen them in person, look, at first glance, like Abstract Expressionist paintings. 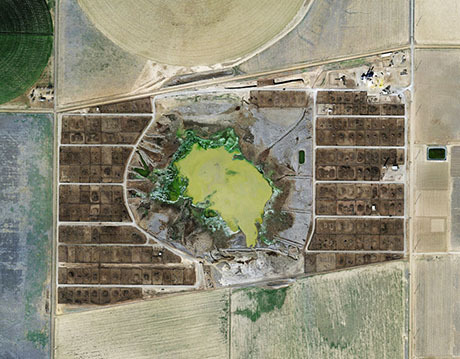 IMAGE: “Tascosa Feedlot, Texas” (2013), Mishka Henner (archival pigment print, 102x102cm). 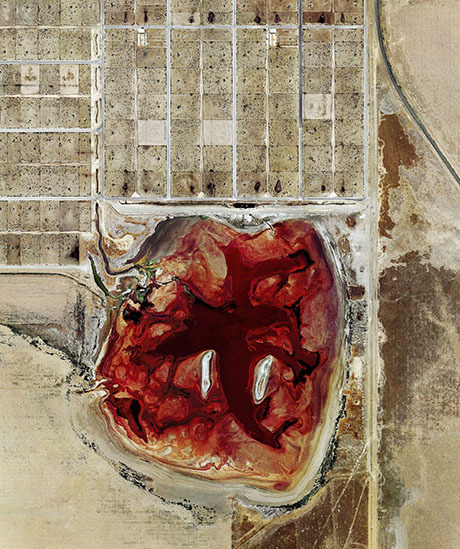 IMAGE: “Tascosa Feedlot, Texas” (2013), Mishka Henner (detail). 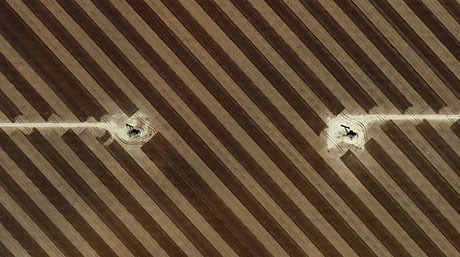 IMAGE: “San Andres Oil Field, Hockley County, Texas” (2013), Mishka Henner (detail). The feedlot’s ecosystem, I could see, revolves around corn. But its food chain doesn’t end there, because the corn itself grows somewhere else, where it is implicated in a whole other set of ecological relationships. Growing the vast quantities of corn used to feed livestock in this country takes vast quantities of chemical fertilizer, which in turn takes vast quantities of oil—1.2 gallons for every bushel. So the modern feedlot is really a city floating on a sea of oil. 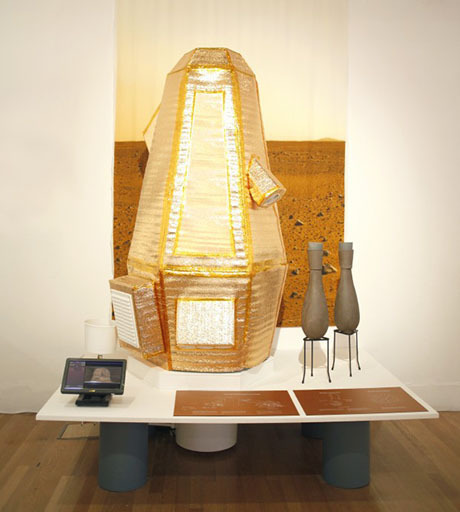 IMAGE: Installation view, Mishka Henner, Precious Commodities, Open Eye Gallery, 2013. On display at Liverpool’s Open Eye Gallery earlier this year, Henner’s oilfields and feedlots were installed alongside a set of geological maps, setting up a clever visual connection between the cartographic representation of subterranean resources and the similarly abstracted quality of the surfaces that their extraction and utilisation produces. 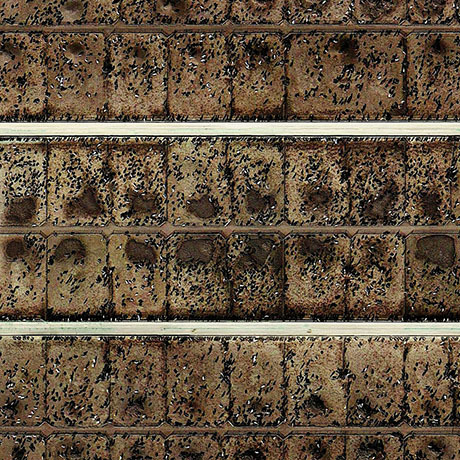 IMAGE: “Producers Feedlot, Texas” (2013), Mishka Henner (archival pigment print, 102x102cm). In some ways, Henner’s feedlots remind me of the work of David Maisel, who has also made troublingly gorgeous photographs from the striking patterns and colors of toxic landscapes viewed from above. However, Henner’s work is not only commenting on the landscape, but also the act of photography itself: rather than taking photographs to document something in the world, he is adding discrimination and perspective — the art of a photographer — to make images from the flood of documentation assembled by machines. 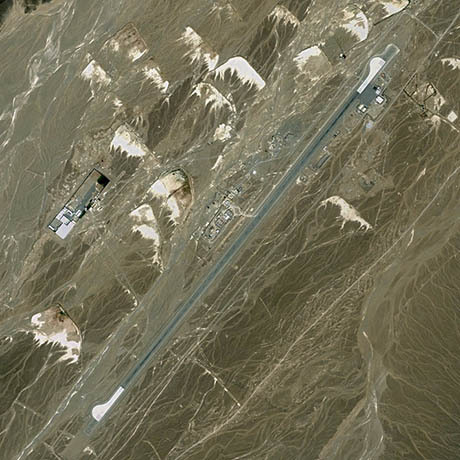 IMAGE: “Central Intelligence Agency Predator Drone Launch Site, Shamsi Airfield, Pakistan, 27°50’52”N 65°9’40”E,” Mishka Henner, in Fifty-One US Military Outposts, 2010. As Henner’s earlier work, collecting satellite images of U.S. and Dutch military sites, demonstrates, the Internet is already home to plenty of powerful, subversive photography that documents otherwise off-limits landscapes. Nothing, no matter how remote or restricted in access, is truly secret anymore — we’re just not, for the most part, looking hard enough at what’s already out there. 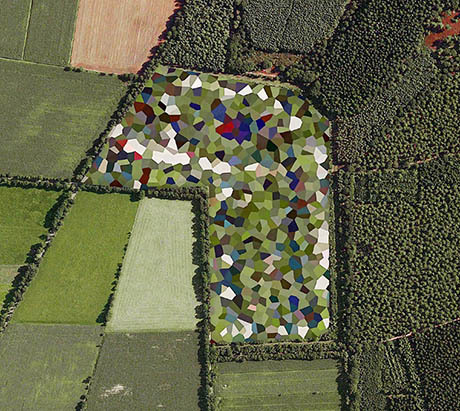 IMAGE: “Staphorst Ammunition Depot,” Mishka Henner, in Dutch Landscapes, 2011. Of course, Google Earth satellite imagery of many sensitive sites has been obscured by pixellation — or, in the case of the Dutch, by multi-coloured polygons — at the request of the governments concerned. Still, in direct opposition to their intended purpose, these interventions act as signposts, revealing the location and importance of ammunition depots, artillery ranges, and military bases. 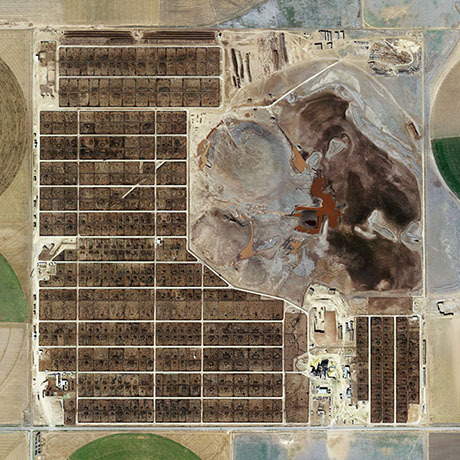 IMAGE: “Producers Feedlot, Texas” (2013), Mishka Henner (detail). In an era of “ag-gag” laws, in which industrial-scale meat producers have persuaded several compliant state legislatures to make the act of documenting animal facilities with defamatory intent a crime, Earth’s manmade constellation of satellites may yet provide the only documentation of the landscapes that agri-business would rather keep hidden. Redefining the act of photography is not just a philosophical conceit in this instance; it is a necessary progression to continue the photographer’s work of helping us see the world. Keep in mind that there are also many small feedlots that are well kept, clean properties and run by families that care about the health and well being of the livestock. If there was ever a digestive tract that was designed to digest grain, it is that of the cow. I am a beef producer and an omnivore. Save the wild horses, save the water, save the air, save the land, save the planet. We don’t need beef to have a healthy diet. We don’t need any meat. We need fresh organic fruits and veggies, beans and squash and native blue corn. We need clean water. We need clean air. People can get all the animal protein they need from a little milk and cheese from happy backyard and SMALL farm pet goats and cows, and backyard chickens who eat the bugs in Organic backyard vegetable gardens. Forget Profits. We need to change the way we live. We need to think of the EARTH FIRST. If only people would stop eating meat. The grain and water used for livestock should be used for people and animals in need. Also potable water is scarce and getting more so rapidly. So sad. By the time the general population wakes up to the devastation propagated by humanity upon this planet, it will be to late to reverse it’s effects. Perhaps these images can help bring some of this to light. lovely ….all that waste going into our drinking water, a real work of art …NOT! The cow’s are living a short and miserable life. They must feel so lucky that the misery will be soon be over when they are hung up and their throats slit. More art …..NOT! Blaine you live in La La Land. I am vegan and would never eat fast food . My water has been filtered and filtered again. and again. For an artist you are disappointing. All the artist’s I know care about the environment. Well enjoy your cow corpse full of toxins, growth hormones and your dirty toxin filled drinking water. Do research and maybe you might nurture for yourself a conscience. @ Blaine, you either work in the Beef industry or are in complete denial my friend. The meat and dairy industry in this country are totally disgusting. Blaine, your comment is the most ignorant thing I’ve heard today – please, please do some research. Read something by Joel Salatin or Michael Pollan, follow some “real” farmers, they have blogs you can read, most have Facebook pages and see what’s going on. These feed lots and the way we produce beef in this country is disgusting and reprehensible. It doesn’t have to be this way, we need to go back to buying our food from local farmers on a small scale or producing it ourselves. If you’re reliant on the federal government to do what you think they do (they don’t) then you’re in deep crap. Blaine – really … why is it better to not disclose your business practices to the public? in your words …”” so uneducated people don’t start a social media uprising on issues they know little to nothing about.”” I am confused as to why, as you say, an educated person feels any fast food is nutritious. Why would it not be more beneficial for people to grow and eat food that is grown with no chemicals or hormones or concentrated minerals. Most of the doctors in my area only buy organic fruit, vegetables and free range meat directly from local farmers. We only eat fruit/vegetables, nuts, legumes and grains that are organic. Have our “B” levels checked and in 2 years have not missed eating the flesh or drinking the milk of another species. I agree that the men and women in the food industry are hardworking. Are you really that obtuse to believe that they love caring and working with cattle, pigs. sheep, chickens etc? Like everyone one on this planet you do what you have to to get food, clothing and shelter. Most try to do it with as little cost and effort as possible. Make no mistake, there is no love lost for the defenseless animals. It only tastes better at expensive restaurants because of the better quality of drugs and the shorter life span in the feed lots. I won’t even go into the high and strict regulations of the U.S. Government. I would be curious to know who you think controls the Senators food & drug policies of the Government. Just glad I live in Canada. I’d like to see similar photos relating to the watersheds the feedlots are a part of. Not sure how these pictures are “disturbing”. One thing people need to consider is that in 2013, when most of the photographs above were taken, was a year of extreme drought. That means its more than likely a skewed representation of what the feedlots actually look like on any given year, during times of drought minerals get concentrated in soils which could explain some of the “extreme coloring” in the photographs. Secondly, cattle feeders aren’t creating an ecological unacceptable phenomenon. Let’s consider cattle numbers are the lowest since the 1950’s if you will. Above all, feedlots are held up to high and strict regulations and monitored by the U.S. Government. The reasons why it may seem like feedlots have “something to hide”, which they don’t for anybody who may actually be worried, is so that uneducated people don’t start a social media uprising on issues they know little to nothing about. Lastly, feedlots produce beef, a highly nutritious, protein packed product to feed the world a low cost. So you can eat that $1 hamburger/cheeseburger at McDonalds and they also create jobs to employ hardworking men and women who love caring and working with cattle. My aesthetic appreciation is completely overrun by the disgust I feel when observing these ethically and ecologically unacceptable phenomena. But thanks for making and showing this, anyway. Phenomenal. And very disturbing. Not sure how to reconcile the two. The feedlot shots are amazing and disturbing. Thanks for drawing attention to this important work. Zoom in on 41.3657, -99.667 on Google maps. It’s a mile wide and +1.1 square miles in size. One wonders what the dark brown areas are. Lagoons???? ?